Revolution for cats prevents fleas, heartworm, ear mites, hookworm and roundworm. With Revolution For Cats on your side, your cat won’t have an itch that you can’t scratch. You’ll be free to lavish kitty with the undue amounts of attention that he or she has become accustomed to without worry or restraint. So stop that tail from twitching, and keep that hide from itching with Revolution Blue. How much does a cat wear for 2.6 kilograms? Or should I apply a little bit according to my weight? Tell me the exact capacity. For cat weighing 2.6 kilograms, you should apply 1 tube/dose every month. This 12 pack will protect your cat for 12 months. Does Revolution for cats have any "Tick" protection? Looking for Revolution product only needs applied every 3 months and is good for heartworm. Is this it?? Revolution needs to be applied monthly. Is it safe for me to use this product with Frontline at the same time for ticks? Yes, you can use Revolution and Frontline at the same time. How long will it usually take to reach south Florida? Sometimes it can be within a week but depending on the customs processing times, it is generally 10-15 business days. Bandit does not have fleas. The vet prescribed Revolution in the event he might have them at some point. Without this topical, Bandit would lick himself raw. Revolution is the best flea treatment I've ever used for my cats. 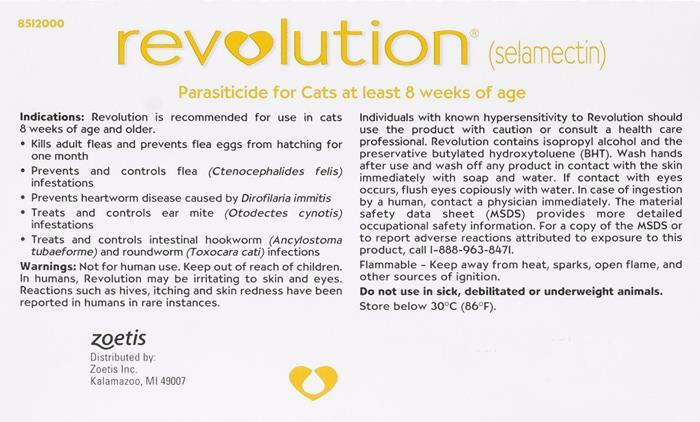 In addition to flea control, Revolution treats/prevents ear mites and several other pet parasites. It comes in easy to apply single use applications. I live in Florida where pet pests thrive, I've found no better treatments anywhere. Keeps my house FLEA FREE! We've tried lots of different products and I'm happy to say this one finally works well. We live on a farm and fleas are just par for the course. They come with the territory. Our cats ALWAYS find their way inside to sleep with my boys. With Revolution, I'm happy to say I am only cleaning up hair and not having to exterminate and treat for flea infestation! So glad to have found PetBucket and Revolution.